First and foremost, start with a clean stove. Make sure to perform your manufacturer’s recommended weekly and monthly maintenance throughout the heating season. In addition, we recommend having your stove cleaned and serviced by a processional once a year (or every 2-3 tons, whichever comes first). Thoroughly clean and inspect hopper, auger plate, and switches. Inspect and clean auger, auger motor, combustion blower, and convection blower, and repair as necessary. Inspect all seals throughout the unit. Thoroughly clean out exhaust pipes and venting to the outside air. Inspect and clean wiring, terminals, electrical sensors, and igniter. Clean entire fire chamber (including burn pot, fire walls, draft chambers, exhaust ports, heat exchangers, and glass) and hearth area, and remove ashes from property. 2. Know what to expect from your stove and your pellets. Most people remove ash from their stove about every 3 days. Most people give their stove a thorough cleaning (including glass, burn pot, fire walls, heat exchange, and ash pan) once a week, and perform monthly maintenance according to the recommendations in their stove manual. Most stoves require a professional cleaning after burning 2 tons of pellets. 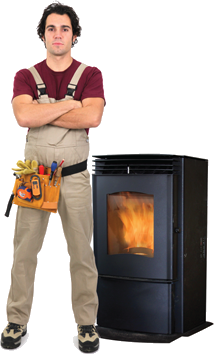 Your pellet stove (or insert, boiler, or furnace) needs the right balance of feed rate, air flow, and heat settings to burn efficiently. If any of those settings are out of whack, you will likely experience problems, even with the highest quality pellets. 3. Troubleshoot like a pro. Every stove is different, and you’ll find some of the best advice in your stove manual. But whether you’re burning pellets for the first time in a new stove, firing up your system at the start of a new season, or switching to a new brand of pellets or a new shipment, here is a quick reference guide for troubleshooting some common burn quality issues. Clean your stove according to your manufacturer’s recommendations. Adjust heat setting to medium or medium/high. Clean all vents, check and repair/replace all gaskets, adjust damper or airflow setting. Adjust air-to-pellet ratio by increasing air flow. Adjust air-to-pellet ratio by increasing air flow and/or decreasing feed rate. Adjust air-to-pellet ratio by decreasing air flow and/or decreasing feed rate. Drop bags on the floor – this can break long pellets into a manageable length.